Soft “twee” or harsh “cheet cheet.” Song is variable canary-like warbling with trills. Description: Bill with crossed tips. Black wings with white-tipped tertials and two broad, bold white wing bars; dark tail. 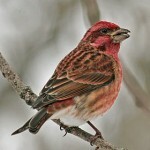 Adult male is bright pink overall. 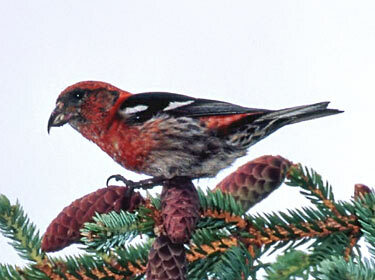 Immature male is mostly yellow, with patches of red or pink. Adult female is mottled with yellowish-olive or gray above; pale yellow rump; grayish-olive underparts; and yellow wash on breast and sides. Juvenile is heavily streaked with brown, and has thinner wing bars. 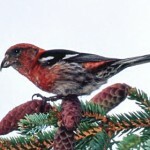 Food: More dependent on spruce cones than the Red Crossbill, and less dependent on pine cones. Habitat: Found primarily in coniferous forests or plantations throughout the year. Where in Nebraska: Rare and irregular spring migrant and winter visitor, mostly in eastern Nebraska. Has been seen west to Scotts Bluff County. 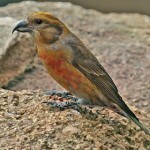 Field Notes: Like the Red Crossbill it wanders widely and irregularly in search of cones. Fun Facts: An individual can consume up to 3,000 conifer seeds a day.